Estimated Costs To Complete Flight Training | Executive Flyers, Inc. This flight training program estimate at Executive Flyers, Inc. at the Sacramento Executive Airport is based on the legal minimum time for the private pilot course. Most students require more than this minimum to complete the courses. In the past, the average English speaking student has taken 50-60 hours to complete the course for an average cost of about $7877.00-$9265.00. The average time for a limited-English speaking student has been 70 hours. 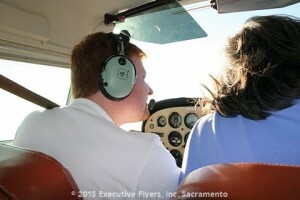 Executive Flyers, Inc. is a Sacramento, California flight school that offers no contract required as well as no “up front” tuition. We believe this helps make flying more affordable and builds trust in you get what you pay for. Note that you have up to 90 days after your solo to get your endorsement.